Jorge Modesto (l) and Larry Javier (r) pose in front of his work, "Relics of the Princess Tártara" today, Thursday, June 8, 2017, during the inauguration of the exhibition of Cuban artists: Celebration for On the Horizon: Contemporary Cuban Art from the Jorge M. Pérez Collection, at the Museo de Arte Pérez, in Miami, Florida (USA). The Perez Art Museum of Miami (PAMM) today inaugurated “On the horizon”, the first of a series of three exhibitions to present its collection of contemporary Cuban art, one of the most important in the United States thanks to a donation of its Founder, businessman Jorge Pérez. The three parts of the project contain both works by Cuban artists living on the island and others residing abroad, including Alexandre Arrechea, Carlos Garaicoa, Hernan Bas, Yoan Capote, Teresita Fernández, Enrique Martínez Celeya, Glexis Novoa, Zilia Sánchez And Julio Larraz. A score of the artists represented at the exhibition, such as Antonia Wright, José Bedia, Juan Carlos Alom, Luis Cruz Azaceta, Tania Bruguera, Rubén Torres Llorca and Sandra Ramos, will be present tonight at the opening. “This exhibition is a celebration of a donation,” said Efe Tobias Ostander, the artistic curator of PAMM, on the more than 170 pieces, including canvases, drawings, photographs, installations and sculptures, which were part of the private collection of the entrepreneur And since December 2016 they are from the museum. Perez also gave them 15 million dollars to continue increasing the Cuban collection, and some of the works on display from today have been acquired with those funds. “It is still not MOMA and I would like it to be MOMA.We have a lot to do,” Perez tells Efe to emphasize that he will continue to contribute to making PAMM an artistic reference in the world, although it is already “recognized” By the critic. PAMM, which is based in a building of more than 18,600 square meters, built by the Swiss architects Herzog & de Meuron and located on the banks of the Bay of Biscay, has received over four years of operation more than one Million visitors. 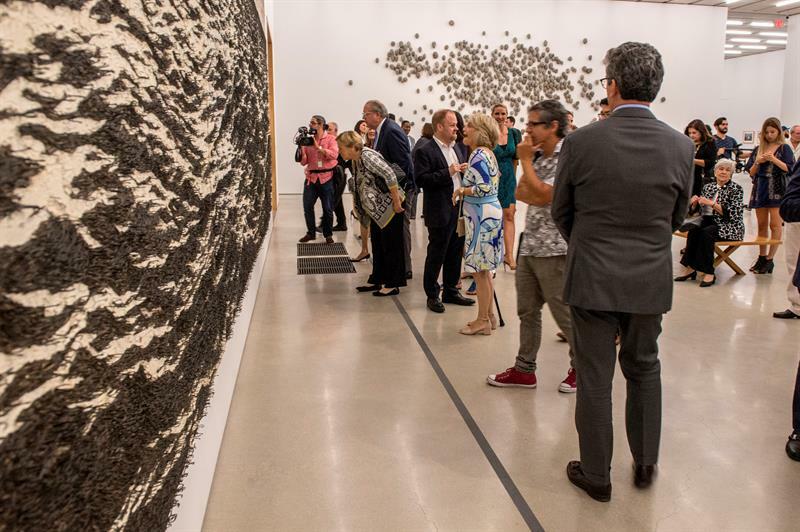 Visitors observe the work “Isla”, by the artist Yoan Cappote, today, Thursday, June 8, 2017, during the inauguration of the exhibition of Cuban artists: Celebration for On the Horizon: Contemporary Cuban Art from the Jorge M. Pérez Collection, in The Perez Museum of Art, in Miami, Florida (USA). Perez, with business mainly in the real estate sector, says he feels “an American of Latin American descent.” Born in Argentina, his family inheritance is in Cuba, he studied all the high school in Colombia, where his family exiled, he says he feels “at home” in each of the three countries. His desire is that all of his private collection, not only the works of Cuban artists, pass to the PAMM, but he does not want it to be kept in the museum’s stores but is “alive”. What today is shown in the museum are mainly works by living artists, because Pérez is interested especially young artists, discover and communicate with them. As a collector, he seems to be “more creative” and gratifying than to look for works of consecrated and deceased artists, whom he can not personally meet or talk to about his art, he says. In his opinion, the Cuban artists who live outside his country, he is a little bit like himself, who strives to emphasize his Latin American being in order not to lose his roots. “Almost everyone who left and lost the country has a great sense of being Cuban,” he says. Ostender explains that he chose the name “On the horizon” for the first part because he noticed that there were many works of the donation in which images of the horizon appeared, a theme that suggests nostalgia for the past and also future. It is something that reflects two very different meanings of time, which gives the longing for the lost and the future as a concept present in the revolutionary language, explains Ostender. “Making Abstract History” and “Domestic Anxieties” are the titles of the following two exhibitions on contemporary Cuban art in PAMM. The project, which also includes talks and meetings with artists and a seminar on contemporary Cuban art, will be developed over almost a year and will lead to a book with photographs and essays on the works. “For Miami it is an achievement to have this collection that reflects the importance of the Cuban artistic community in this city,” says Ostender.